This Pineapple and Cream Filling tastes amazing and is SO easy to make! We absolutely love this thick and flavorful filling with yellow cake. I’m a big fan of “mock mousse” fillings (such as our Chocolate “Mock Mousse” and Orange Cream fillings) because of their wonderfully light and creamy whipped texture. The same is true for this Pineapple & Cream filling, only this time we’ve folded in crushed pineapple which adds more texture to the filling & tons of refreshing pineapple flavor! 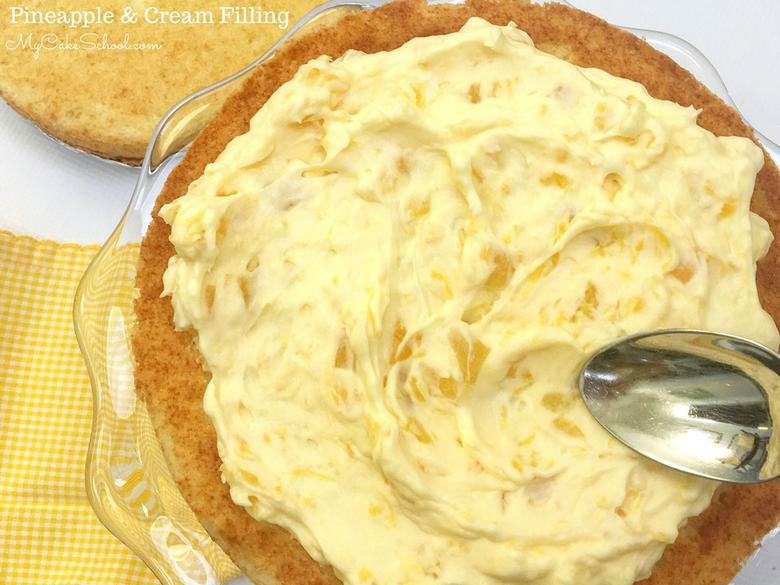 This vanilla pudding and pineapple combination is much like the filling used in a southern Pig Pickin’ Cake, minus the oranges and whipped topping. Next, fold in your drained, crushed pineapple until you reach a spreadable consistency. That’s it! In our pineapple cake, we used this as a filling as well as a topping for the cake. It is light, luscious, and tastes amazing! If you love pineapple, don’t miss our other delicious Pineapple Filling which is a cooked recipe. 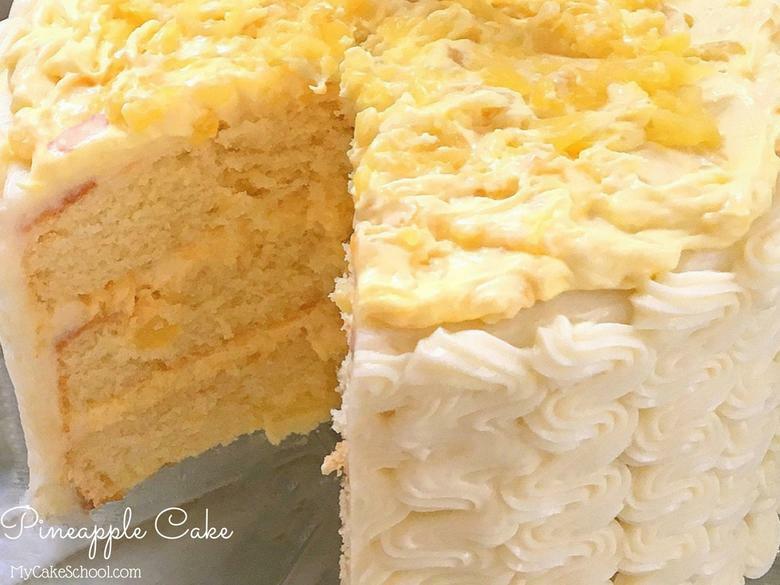 We used this pineapple filling in our Piña Colada Cake. Find the deliciousness here! : Pineapple Filling . Both pineapple fillings are amazing, however the Pineapple and Cream filling can be made more quickly and has a thicker, creamy consistency. It’s good to have choices! We have a post for Pineapple Cake which features this delightful filling with our homemade yellow cake. Find it here! : Pineapple Cake Recipe. SO good! Here’s a photo of the deliciousness in action. Mmmm…..
*Thanks for stopping by! We hope that you enjoy this delicious recipe. Don’t miss our full collection of tried and true cake, frosting, and filling recipes in our Recipes Section! We also have an ever-expanding collection of Free Cake Decorating Tutorials in our Free Tutorials Section! Finally, if you are interested in having full access to the hundreds of cake video tutorials we’ve made, hop over to our Join Page for all of the details on becoming a member of My Cake School. We’d love to have you! This light and delicious pineapple & cream filling tastes amazing and is so easy to make! •	25 oz.) can crushed pineapple, DRAINED. I did not need the whole can. The mixture will become thick and fluffy. Fold in crushed, drained, pineapple until it is a spreadable consistency. This is a wonderful filling in white and yellow cakes! If you are not a fan of the pineapple pieces, you can puree them instead, and spread in between your layers before filling with the thickened vanilla pudding. Cakes with this filling will need to be refrigerated. I made a variation of this using cream of coconut pudding in place of the vanilla and I added a little pina colada and rum extracts, turned out great for my pina colada cake! Can this be frozen? Heather, that sounds soooo good! I’ve never attempted to freeze but my guess would be that it would lose it’s volume. If you decide to experiment though, let us know how it goes! This can be frozen, I had some left over so I gave it a shot. When I thawed it to see if it was useable, it was perfect, no texture changes! It was frozen for about 2 and a half weeks. Hi, what does 2c mean? Great, Melinda! Love that idea. Used this for a good friend’s birthday cake, and everyone went wild for the filling! Everything I have made from your site has been a BIG hit! Thanks so much for all the great recipes! Hi Ligia, to make a buttercream dam………..using your regular buttercream recipe, take out whatever amount you think you will need (probably 1 cup for a typical 3 layer 8 inch cake) put that buttercream in a bowl and thicken it to a very stiff consistency and pipe it around the outer edge of your cake layer before you place the next layer on top. The buttercream dam helps to keep the cake from bulging and also helps keep soft fillings in place. Melissa demonstrates this in the video entitled Making a Scratch Cake from Start to Finish. It is a long video, but you can skip ahead to about minute 19:30 and Melissa will be showing how to make a buttercream dam. Hi Melissa and Bebe, I have a question. I wanted to use this filling in a cake that will be covered in marshmallow fondant. I see that this filling needs to be refrigerated…but I’ve usually heard that you shouldn’t put fondant covered cakes in the fridge. Is there a better type of fillings to use for fondant covered cakes? Thanks! How long can this be left out before is spoils? Thank you! It will be used as a filling so the cake will be cold and it will also depend on the coolness of the room it is being served in, but I would probably put back in the refrigerator after an hour, just to be safe. 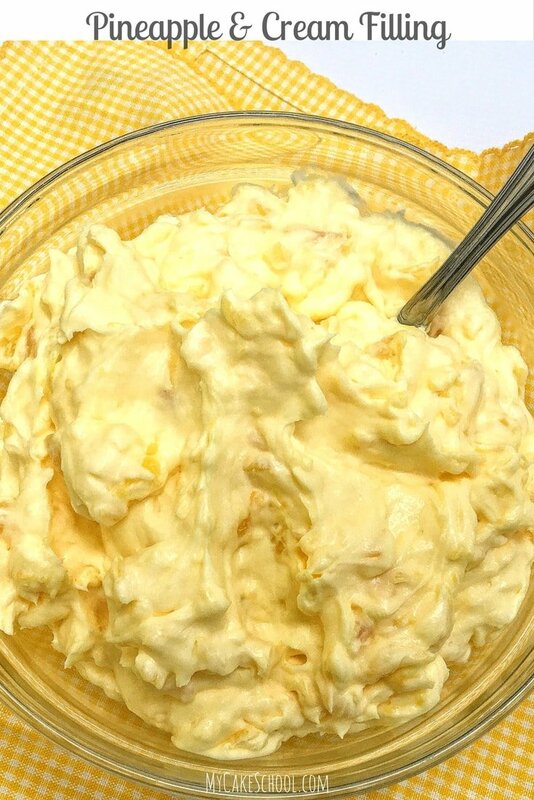 In this receipe, are you talking about the liquid whipping cream? Hi Beth, It is liquid, a heavy cream, or whipping cream. I tried this filling and I can see how it would be delicious with fresh pineapple, but I did not like it with canned pineapple (I might have drained the juice too much). I tried this recipe with fresh raspberries and it was excellent.